The Book Rat: A Definitive Ranking of Austen Men: VOTE NOW! As I mentioned a few days ago, I'm taking a different approach to our Janeite Conversations this year, and am encouraging all of you to weigh in on some Very Important Things, re: the best and worst of Austen. Today's topic is something that draws a lot of Austen fans in, and keeps them coming back for more (and more, and. . .) and that is AUSTEN MEN. Please tell me in the comments your absolute favorite, best of the best, Austen man. It can be a main character, it can be a side character, whichever gives you FEELS, rank him #1. I know how hard it is to pick just one, so feel free to give me your top 3. Your top 5. The characters you wish you'd see more of in the books, the ones you think you'd get along with. Who would be your "Marries" in a game of Kiss, Marry, Kill — I wanna know them all. AND the bad ones — who don't you love? Who would you rather see fall off a cliff than have to be in a room with for more than 5 minutes? Rate them. Rank them. Spill all the dirt on why. 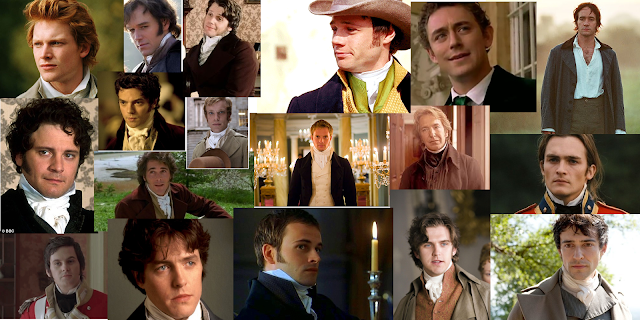 I'll be taking people's answers, tallying up the math, and working everybody's answers together into an ultimate DEFINITIVE RANKING OF AUSTEN MEN, which will go up early next week, so get your rankings & swoonings in early! [Psst! If you need inspiration, or you just don't understand what the hell I'm talking about, make sure to check out past Janeite Conversations! 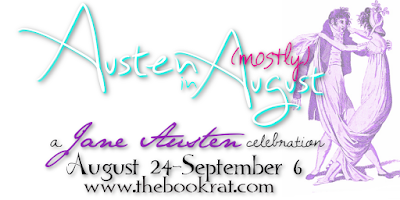 You may find our discussion on Austen's bad boys especially helpful. Otay! *cracks knuckles* Let's get started. Need to meet a nasty end: Mr. Willoughby, Mr. Wickham, Mr. William Elliot, Mrs. Norris (I just know he's a man masquerading as a mean old woman). Oh, a deliciously juicy challenge! 1. Henry Tilney. He's kind, he's funny, he knows himself, he's generous, he's patient, and he's got a backbone. I think he's the most approachable of the Austen heroes (that don't turn out to be douchecanoes in the end). I'm always a little in love with him, in the book and every adaptation I find. 2. George Knightley. Smart, kind, generous, a homebody, wealthy, whatever the opposite of a classist is. 3. Colonel Brandon. As much as it creeps me out that he's a wee bit obsessed with making up for the past through getting swoony over a moody teen, I realize that was totally acceptable then. So, ok, that aside: he's a decorated hero, he's obviously very loyal and caring, he's compassionate, and he's patient. I bet he looks amazing in uniform. 5. Darcy. I think I'd feel a constant pressure to keep up with his intelligence and dignity, and while that's fun during courtship, it's be exhausting for years of marriage. He seems a decent fellow at the core, but I could't take the pressure. 7. Edward Ferrars. Nice guy, very loyal. Not terribly dashing, but he seems solid and likable. 8. Bingley. Nice guy, but takes ‘bros before hoes’ a little too seriously. I couldn’t trust him to be constant in his affections. 9. Frank Churchill. He did have a choice to hold himself to a higher standard of behavior, and instead he flirted with other women in front of his secret fiance. At best, he’s unaware of the pain he causes, at worst he’s reckless even with the affections of a woman he truly loves. 10. Edmund Bertram. Aside from his relatives and how easily he’s manipulated, I don’t think there’s anything wrong him him. We love to hate him because he’s very bland, but maybe there’s a secret pirate lurking in him? 11. Tom Bertram. He’s a bit too focused on living a fast life, but the fact that he’s struck down as a result makes me hope he’d recover to be a kinder, more compassionate man. 12. Collins. He’s a gasbag, and annoying beyond measure, but I don’t think he’s a genuinely bad guy. 13. Mr. Elton. Any dude who needs copious amounts of alcohol to confess his feelings is someone you’d do well without. What a prig. 14. John Thorpe. Vain, crude, utterly self-centered. 15. Henry Crawford. The only thing he loves is himself. He hatches a plan to break a girl’s heart because he’s bored, and then comes to admire her (I’m guessing she’s the first women he’s admired in his life, perhaps aside from his sister) and is so confused he simply has to go have an affair with a married woman while leading her sister on. He doesn’t want to be reformed- he wants someone else to change him. A man who isn’t willing to put the work into being a better person is a man who won’t work toward a happy marriage. 16. John Dashwood. Well, he's the worst- he's mean, elitist, money-grubbing, and I can't get over his breaking of a sacred vow to his father. Plus, his taste in women is horrid. 17. Wickham. A repeat offender of ruining women for his own enjoyment. 18. Willoughby. He's inconstant, self-righteous, and self-absorbed. He ruined a young woman and abandoned her. So, also a repeat offender.